The Deliberate Agrarian: Deliberate AgrarianSnippet #36Tommy Toe Experiment Results…Success! 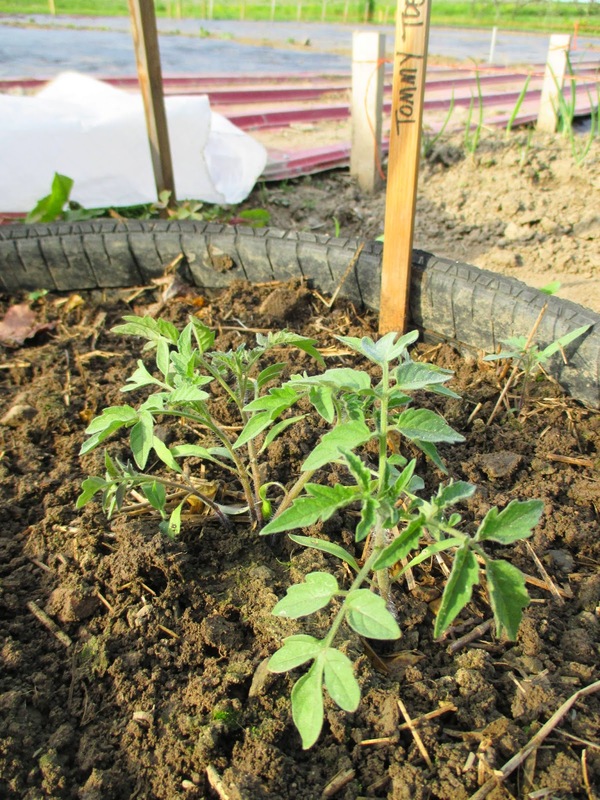 "Is it possible to completely eliminate the fuss of starting tomato seeds indoors every spring by simply "planting" some tomatoes off the vine into the garden in the fall?" That's the question I asked late last year as I mooshed several overripe Tommy Toe tomatoes into the soil of one of my Whizbang low-rider tire beds. As I explain in my Planet Whizbang Garden Idea Book, these little circular beds are a perfect place for garden experimentation. 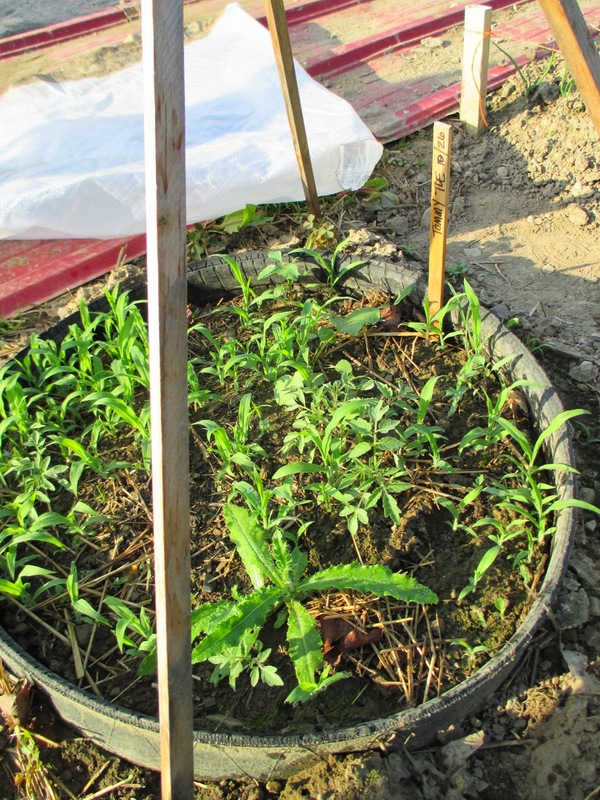 I blogged about the tomato experiment In This Post. Compared to the number of seeds I planted, relatively few tomato plants have come up. But there are enough. If you click the picture to get the enlarged view, you'll see the stake which indicates that I planted the tomatoes on October 26 of last year… That is exactly seven months ago. 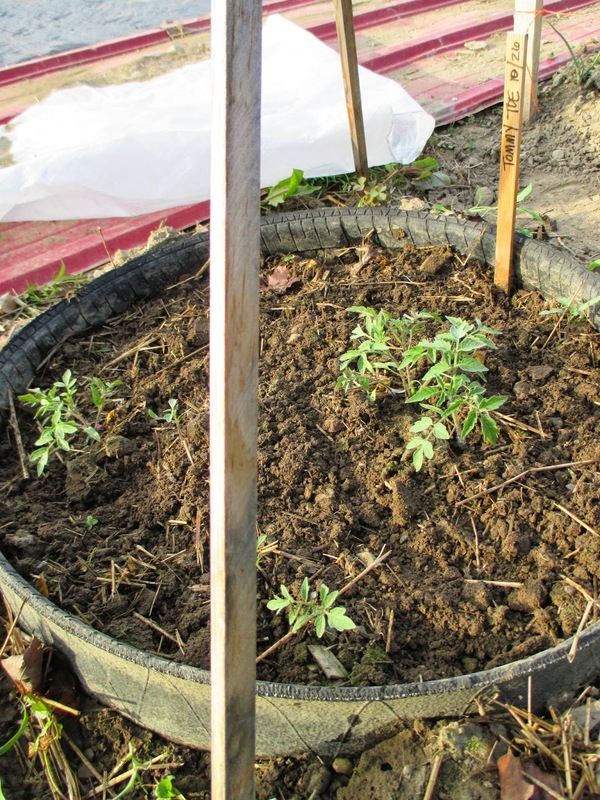 The tomato seedlings in the tire bed are smaller than my carefully-planted-and-tended seedlings in a plastic cell tray, but the "feral" tomato plants look healthier. This is an idea I intend to continue to experiment with. The plants that come up like that are some of the strongest and have survive may things to emerge in the spring. I have several unnamed varieties that I have been found volunteer in the garden. I still save seeds but it is neat how you can leave seeds overwinter in the garden like that. My grandmother (and every other gardener I know) calls those, "Volunteer" plants. I've noticed they are always strong, too. I've wondered if it might be just as well to plant them in the winter. Thanks for the post. great idea ...I used to let some tomatoes grow from overwinter seeds (the ones that grow and I don't remove) it provided me with lots of tomatoes and little effort. I have tomato plants coming up in the piles of pig poop we've cleaned out of the pens. They are greener, stronger than any in the garden. I fed a bunch of overripe tomatoes to my chickens. I have since moved them to another pen and the old pen is overgrown with tomatoe plants ( and one crookneck). They are twice the size of my cared for plants in my garden. Think they might have gotten more " fertilizer" via natural bi-product. I have always had volunteer tomatoes in the spot where they grew the previous year. If I want to use them I just dig up a huge helping of dirt with them in the middle and transplant it to the new location. We threw out some rotten cherry tomatoes into our compost heap a few years back and last summer, 4 huge, lush plants came up! Sadly, they appeared much too late in the season for our 3 month alpine Western Washington growing time. But they were loaded with fruit and we were able to make some spectacular green tomato relish from them! Herrick, I tried leaving some tomatoes on the vine last fall. When seed planting time came around, I harvested two winter-dried tomatoes, pulled out the seeds, and planted 24 of the choicest, along side my store bought seed. Perhaps I culled them poorly, but only three sprouted. They were later, and more dainty than the others. All three have since died. I am thinking autumn sown as whole tomatoes is preferrable. OK, worked for a time at a wastewater treatment plant. The end result of processing was 1) water cleaner than the river receiving it & 2) dried compost aka sewage sludge, in sand beds. 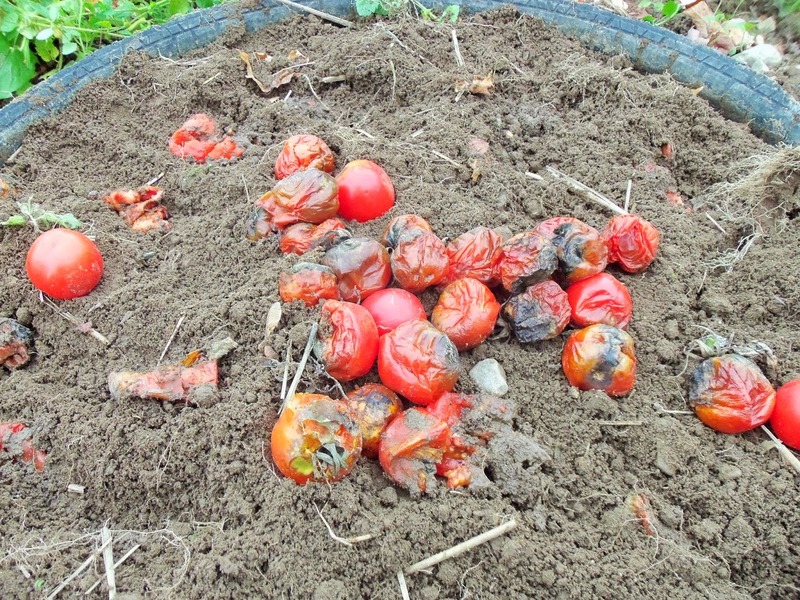 The sludge, produced year round would dry in summer and produce tremendous crops of TOMATOES. Only tomatoes, cherry size. They tasted great too - just don't eat the ones on the ground.